There are over 7500 cultivated varieties of apples. Along with roses, apples belong to the Rosaceae family. They grow on a deciduous tree that blossoms in the spring and yield its fruit in late summer/early autumn. The saying “an apple a day keeps the doctor away” originated in 19th century Wales. The reasons why are as follow. Apples are a source of both soluble and insoluble fiber……… Soluble fiber helps to prevent cholesterol buildup in the lining of the blood vessel walls, thus helping reduce the incident of atherosclerosis and heart disease. The insoluble fiber in apples provides bulk in the intestinal tract, holding water to cleanse and move food quickly through the digestive system. Apples are often referred to as “nature’s broom”. They also contain calcium, phosphorous, potassium and Vitamin C. However the majority of the fiber and nutrients are actually in the peel itself. So it is imperative to eat the peel! Non-organic apples known as conventional apples currently rank higher than any other fruit or vegetable in terms of pesticide residue–approximately 56 chemical residues per apple! Since it is imperative to eat the peel, when picking apples, always choose ORGANIC. Apples can be eaten in a variety of ways. Apple slices with a sprinkle of Celtic Sea Salt brings out the delicious sweetness of the fruit itself. Organic nut butter with apple also a tasty healthy treat–especially for the young’uns. And let’s not forget good ol apple sauce. Apple cider vinegar is one of the oldest, most powerful, healing home remedies imaginable. 10,000 years + to be exact. Apple cider vinegar is made when fermented cider is fermented a second time. The double fermentation fortifies it with extra acids and enzymes. 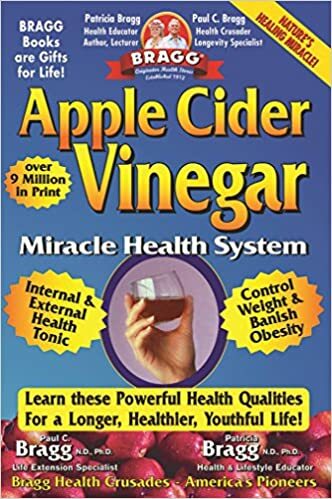 Apple cider vinegar is used to treat about a gazillion conditions. Hippocrates used apple cider vinegar to support his patients’ health. Being no fool, he mixed it with honey both for taste and the magnanimous benefits of good quality honey. Both apple cider vinegar and honey have a low pH, but both turn alkaline when consumed. Maintaining a proper pH balance is extremely important for your health. It is key for the optimal functioning of all your body’s systems: digestive, immune, circulatory, muscular, respiratory, nervous, and even your reproductive system. Some consider Apple Cider Vinegar to be the “roto-rooter” of all joint problems and the best GOUT cure ever!! NOTE: On every single office visit, I check the Ph. Most often it is acidic, sometimes balanced and rarely alkaline.. Please buy the book by Paul & Patricia Bragg, Here is the Bragg Library Link. Please go to the Bragg website. Please read everything Bragg. NOTE: For Gut Health, Mix 2 or 3 teaspoons of apple cider vinegar with a teaspoon of organic honey in a cup of warm water, and sip slowly. Alternatively you can use it to pour it on your salad. NOTE: Apple Cider Vinegar pills or capsules do not work. Dosing: The Braggs in their book have a ton of dosing recommendations. t is said a tablespoon a day keeps the doctor away. Depending on the situation, a good rule of thumb is 2 ounces of ACV in 4-6 ounces water before meals; then the Hippocratic ACV with honey warm water drink; then there is salad dressings galore. NOTE: To aid in digestion, I am always recommending Hydrochloric Acid such as HCL Pro-Zyme or Betaine HCL w Pepsin. HOWEVER, I would much prefer the food source of Apple Cider Vinegar over the pills and NEVER Apple Cider Vinegar pills.. These three posts below explain a little bit about Acid, Stomach, Proton Pumps, etc.